The President, Centre for Change and Women Arise Initiative, Mrs Joe Odumakin, has narrated her dream of becoming a reverend sister while growing up. She featured as a guest on Channels Television’s Rubbing Mind where she shed more light on her desire to totally serve God and mankind. “When I was about completing my secondary school, I was filling the form; I also wanted to be married to Jesus (because) I never wanted any distraction,” she said on Sunday. According to her, the decision to become a reverend sister and not get married was largely influenced by the Catholic school she attended while growing up. The activist added, “As staunch Catholics, we started out while we were very young in church, confirmation, holy communion – a lot of things happened. On how she ended up as an activist, Odumakin said she learned quite a lot from her mother who she considered her mentor. While many young girls seem to be closer to their fathers, her case is entirely different as she claimed to have grown up under the roof of guys. The human rights activist described her mother as one who would confront people, settle quarrels, and fights for the course of justice. “It is from my mum because growing up, I watched my mum as a princess. And I see her do a lot of things. She confronts people, hates injustice and always confrontational,” she narrated. 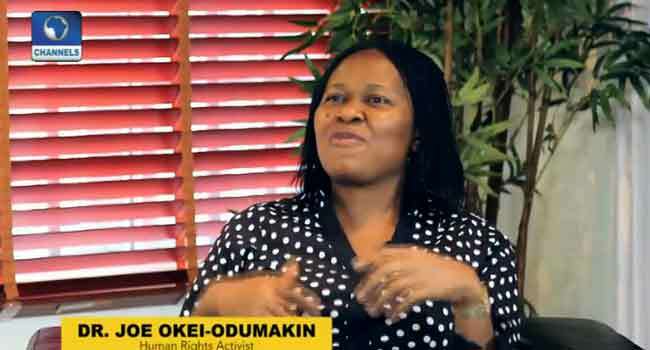 Odumakin stressed further that despite being detained for at least 17 times during military regimes, she remained undaunted in her fight against injustice and oppression. Her resilient spirit has not gone unnoticed within her 25 years of active unionism as she has raked in several awards to her credit. Some of the honours she has received include Hero of Democracy and Good Governance (2007), Advocate of the Masses (2006), Certificate of Merit Award (2014), International Woman of Courage Award (2013), and Eminent International Gold Award (2013) among several others.